"Ross Bauer's Piano Quartet, in its West Coast premiere, also pits the one against the many, ..... in this case three strings versus one pianist....The first movement features solos in which the violist, cellist, and pianist each take turns musing with minimal interference, and the second movement offers extensive space to an achingly beautiful violin solo (played by Ana Presler). By contrast, the third movement has the most tension, both rhythmically and timbrally, with dancing, fidgeting passages in the piano, and wailing tones in the strings...Bauer's fifteen minute quartet has moments of great promise, such as a beautiful texture with a high cello lines in the last movement ...."
My Piano Quartet, written during the summer of 2004, was commissioned by the Stony Brook Contemporary Chamber Players and is dedicated to them. 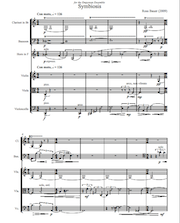 Divided into three contrasting movements, and lasting about fourteen minutes, the piece tends toward a sparer texture than much of my other music. The first movement, in a moderately fast 12/8 meter, features clear-cut dialogues between the strings, often treated as a group, and the piano. One or the other tends to dominate much of the time. An exception is a fairly extensive passage about two thirds of the way through where the strings play lyrical contrapuntal music while the piano, more often than not going its own way, plays loud percussive chords. Near the end of the movement, an uneasy balance is finally established. The second movement is quite soft, slow,and suspended. Beginning with an extensive duo between muted violin and cello, it proceeds to a lengthy unaccompanied piano solo. The rest of the movement gradually shortens the length of the piano and string trio’s utterances until they end by exchanging two, then one measure phrases. The movement remains inward and restrained throughout. The third movement, the most overtly jazzy of the three, features more rapid dialoguing between strings and piano -- both in octaves much of the time. After an extensive climax and a substantial discharging of its energy, the piece comes to a close with a truncated version of the octave dialoguing from the opening of the movement. Thin Ice, for cello and fourteen players, was written for Greg Hesselink and Sequitur during the Fall of 2004 and the Spring of 2006 and is dedicated to them. The third movement picks up a slow lyrical strand that began the second movement as the solo cello unfolds a high melody. This melody consists mostly of double stops and unfolds over slow moving, widely spaced harmonies sustained by the strings. The cello ends the movement with a short (and clearly incomplete) cadenza. for cello and piano. Written for Fred Sherry and Gilbert Kalish in honor of Andrew Imbrie's 80th birthday. "Ross Bauer's "Tribute" (2000) for cello and piano was written to celebrate the 80th birthday of composer Andrew Imbrie. It is a short piece -- just five minutes or so -- but packs a considerable amount of material and energy into its brief time span. Fonteneau began it with a collection of short solo phrases. Only gradually does the part of the piano assimilate itself into the texture. The wonderful Eric Zivian entered with suave self-effacement, but his role gained independence throughout the work, until finally the two were glancing off each other in a driving sixteenth-note passage that led to the work's dramatic coda. The concentration of material and the intensely compressed emotional arch make quite an impression." Tribute is an intense little piece in one movement lasting about five minutes. It makes considerable demands on both performers, the cellist in particular. I’ve made no attempt to emulate Andy’s music in any way, feeling that the best tribute to such a charismatic and powerful figure, one who has encouraged his numerous students to develop what is most individual in their own work, would be to be myself. A fundamental idea of Tribute involves a gradual lengthening of phrases -- from rather short and simple phrases, first by the cello alone, to longer, more complex ones in which the piano, which at first has played a supporting role, becomes more independent. As the piece unfolds, various musical directions are suggested, but are usually cut off, often rather prematurely. This process naturally generates a considerable amount of tension, tension which culminates in the substantial and active final section of the piece. The rhetoric of the piece, more floaty and introspective earlier, becomes quite rhythmic and driving here, leading to a series of repeated notes followed by a long sixteenth note unison passage between the cello and piano. A short reprise of some earlier soft chords leads to the somewhat abrupt ending. Commissioned by the Athabasca String Trio. 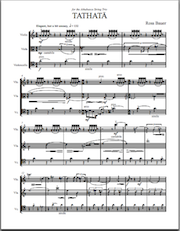 Tathata for string trio was composed during the summer of 2007. It was written for and is dedicated to the Athabasca String Trio who premiered it in October of 2007 at the Tenri Cultural Institute in New York. The title, from the Pali language, means suchness -- a way of experiencing reality without the barrier of language and concepts. In one movement of about eleven minutes, Tathata, falls into three large sections, the first beginning with a viola solo accompanied by a tolling A in the violin and cello. This soon grows into three-part counterpoint, but the idea of repeated notes proves to be ubiquitous throughout much of the piece.The middle section, marked Tranquillo, features a long melody in the violin. Near it's end, the music moves to its highest register to lead into the final section marked Con Moto. 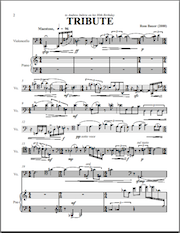 Featuring the most varied, continuous, and dramatic music of the piece, this section builds inexorably, finally leading to a version of the viola's opening tune, now played in three part unison. The final measures of the piece, again featuring the repeated A, now over a sustained F# in the violin, quietly dissolve into silence. 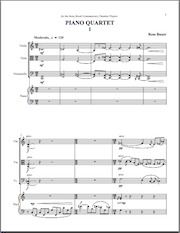 Symbiosis, for clarinet doubling bass clarinet, bassoon, horn, violin, viola, and cello, was composed during the spring of 2009 for the Empyrean Ensemble. It was a pleasure writing it with the sound of Empyrean's wonderful players firmly in mind. Websters defines symbiosis as "the close union of two dissimilar organisms." These organisms, in this case musical ideas, morph at varying rates of speed, and form new alliances. So alliances arise, flourish for a while, and shift. As Symbiosis unfolds, musical continuities become more complex-- phrases and internal sections get longer and transitions are blurred or entirely absent. Although there are clear sectional divisions marked by changes of character, rhythm, texture, and register, the story of this twelve minute piece can be likened to the continuous but not steady traversal of a large arch. I mean this as it pertains to large-scale form, rather than in terms of any long-range registral ascent. The high, bright, annunciatory music near the end of the piece is foreshadowed by earlier tonal references. Symbiosis ends with music in the uppermost register, but the way that it comes to find itself there is not straightforward.